As market forces drive telehealth to the headlines, kiosks can play a vital role in its adoption. In Part I (read it here), we examined the economic climate that has proved conducive to the development of telehealth as a new model of healthcare. Here, we explore deployment of the model via self-service kiosk. Some analysts believe self-service kiosks and patient check-in kiosks will be key to achieving those numbers, especially since they even further shrink the footprint of a typical telehealth arrangement. Notwithstanding the 2016 bankruptcy of telehealth kiosk company HealthSpot, many endeavors are thriving. In Florida, for example, Publix Pharmacy is partnering with the Clearwater-based BayCare Health System to deploy BayCare-branded telehealth kiosks in several Publix stores. The telehealth sites enable patients to speak to a Baycare physician via video-conferencing technology. Patients will also be able to check blood pressure and perform several other screenings at the kiosks. At Sam’s Club, executives announced a partnership with Chicago-based telehealth startup higi (yes, higi) to place health-screening kiosks at 622 Sam’s Club locations with a pharmacy. The program is designed complement the free health-screening program that Sam’s Club already offers. The kiosks, which are free to use, can assess a user’s blood pressure, pulse, weight and body mass index. Since the partnership began there have been more than 11,000 encounters between students at the schools and a remote medical provider from Cherokee Health Systems. But while pharmacies seem like a logical location for telehealth kiosks, other organizations can benefit from offering the service as well, not only to drive consumer traffic but to keep their own healthcare costs down. Hospital kiosks placed at VA hospitals could potentially help speed up their service, while placement at a community center or local retailer could improve care in rural areas. For example, over the past eight years, the school system in Sevier County, Tenn., has partnered with Cherokee Health Systems to use telehealth technology to bring health care to thousands of students, reducing absences due to illness. Since the partnership began there have been more than 11,000 encounters between students at the schools and a remote medical provider from Cherokee Health Systems. In addition, kiosks in the workplace could help minimize lost time by enabling employees to avoid leaving work for lengthy trips to the physician’s office. 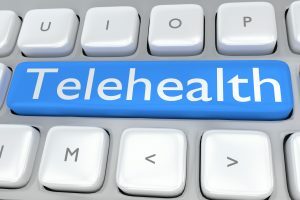 According to a 2016 article in trade publication MedCityNews employers offering telehealth kiosk services to their workers include JetBlue Airways, the Palm Beach Country, Fla., school district and the city government of Kansas City, Mo. In addition, insurance companies are helping to drive the placement of telehealth kiosks at businesses where they have contracts. Anthem, for example, has placed telehealth kiosks with more than 20 employers over the past two years, according the MedCityNews. The insurer said the kiosks were a viable option for companies too small to operate an on-site clinic for workers. “This technology should make it more affordable for employers of many sizes,” Anthem vice president John Jesser told MedCity. Frank Olea, CEO of Olea Kiosks, said there are similarities between adoption of healthcare in self-service and in other industries. “Think back to 9/11, when the travel industries was squeezed like never before,” he said. In other words, kiosks may be just what the doctor ordered.